Several trials of delivery room management have investigated the relative benefits of intubating all the babies (and usually giving them all or most of them surfactant) or trying to maintain them on CPAP. Age of intubation, control group. Morley CJ, et al. Nasal CPAP or intubation at birth for very preterm infants. The New England journal of medicine. 2008;358(7):700-8. The COIN trial. http://www.nejm.org/doi/full/10.1056/NEJMoa072788 There was no difference in survival without BPD, but there was somewhat less severe BPD in the CPAP group, and more pneumothoraces in the CPAP group. Dunn MS, et al. Randomized trial comparing 3 approaches to the initial respiratory management of preterm neonates. Pediatrics. 2011;128(5):e1069-76. The VON DR management trial. http://pediatrics.aappublications.org/content/128/5/e1069.long Study was stopped early for declining enrollment. 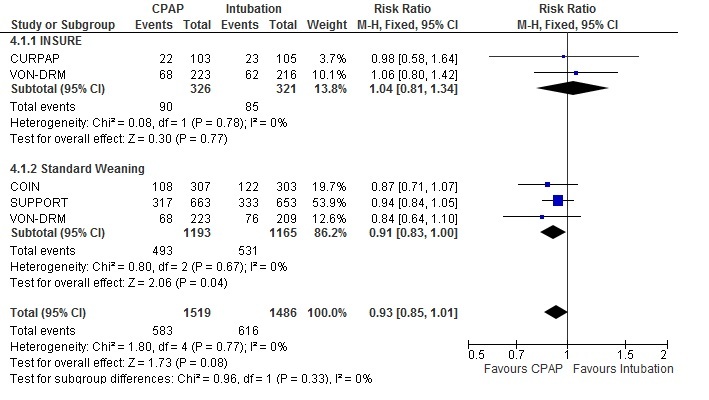 The CPAP group, and the INSURE group had better outcomes (death or BPD) than the intubation and ongoing ventilation group, but no significant differences. Sandri F, et al. Prophylactic or Early Selective Surfactant Combined With nCPAP in Very Preterm Infants. Pediatrics. 2010;125(6):e1402-9. http://pediatrics.aappublications.org/content/125/6/e1402.abstract The CURPAP trial. No differences were found in important outcomes, including the primary, survival without BPD. I performed a meta-analysis of these trials, dividing them according to whether the comparison was with INSURE or with surfactant and traditional weaning. Which means that if you think you need to intubate a baby for surfactant, try to get them extubated again really fast.